You try to connect to your Cisco CSC module, and see the following error. CSC is not activated. Please run setup wizard under Configuration > Trend Micro Content Security > CSC Setup > Wizard Setup to perform setup process. Click OK button to to to Trend Micro Content Security Setup wizard. Naturally if you’ve never setup the CSC you are going to see this, but what if it suddenly starts doing this? 1. 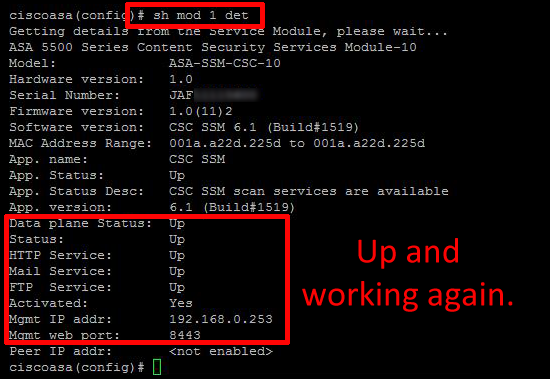 Connect to the ASA that the CSC module is in. 3. This ones unresponsive, it probably just need restarting, to do that issue the following command. 4. They can take a little while to come up (apply the cup of coffee rule). Then to see if it’s back up again use the same command you used earlier. That didn’t work! Sometimes CSC modules do fail!, I had one client go through three in a year, If doing the above or running through the setup wizard (you did write down the licence numbers that came with the CSC didn’t you?) doesn’t work then you need to log a call to TAC.